Primary sludge pumps are typically used in municipal Wastewater treatment facilities to transfer digested sewage and sludge. This is a broad pump category that encompasses positive displacement pumps to pump sludge in ranges usually up to about 500 GPM. The choices of pumps vary from double diaphragm pumps, plunger pumps, double disc pumps, rotary lobe pumps, progressive cavity pumps and more. In todays pump marketplace, there are generally two schools that operators and consulting engineers follow when specifying primary sludge pumps. The first option is to install a more robust pump model with features like ball check technology to manage varying solids percentages or abrasive solids. These pumps typically cost a bit more to begin, but the spare parts costs are much lower down the road. Examples of such pumps are plunger pumps, double diaphragm pumps and double disc pumps. Primary sludge pumps like rotary lobe and progressive cavity pumps typically cost a bit less to begin but the repair parts are over the long run are up to 75% more than diaphragm, plunger or double disc pumps. 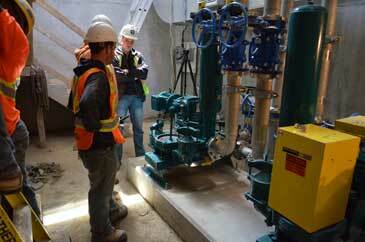 The primary sludge pump photos you see here are at a brand new Norfolk County WWTP operated by Veolia Water. 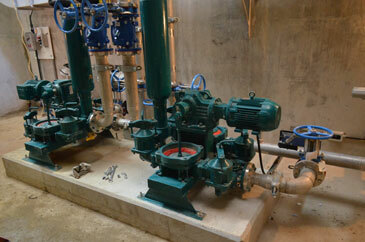 This facility selected Mud Sucker Double Diaphragm Pumps for their upgrade and expansion project. The Mud Sucker model 3B-EC-DD is each capable of flow rates up to 160 GPM. They pump from a digester, and the primary sludge is screened and the engineer on the project also specified a grinder as well. The best part of these Mud Sucker primary sludge pumps is that the wear components like the diaphragms are significantly less (in the $200 USD range) each. Ask a WWTP operator how much rotors and stators cost for their lobe pumps or progressive cavity pumps. 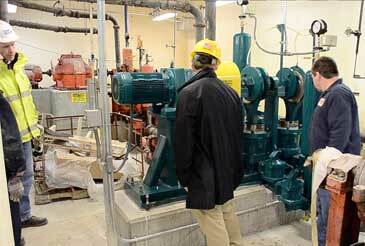 That cost is much higher and the performance of these pumps typically decline as the pumps wear. Plunger pumps are by far the most robust primary sludge pumps on the market. As long as the operators and maintenance crews are trained on proper maintenance of the pump packing, they provide up to 50 years of solid pumping performance. Wastecorp does lunch and learns with engineers about primary sludge pumps and it seems like preferences rotate from one technology to the next but ball check technology remains a leading choice for most primary sludge pump applications in North America.